In early May 2018, CBS Los Angeles reported that police officers in Burbank, CA were able to apprehend a woman and a man who they suspected had almost $20,000 worth of perfume because some of the merchandise had GPS tracking devices attached to them. We’ve been talking a lot lately about GPS tracking at work and how employees feel about being tracked or having their work vehicles tracked. In our last post, we looked at how police officers in Massachusetts view having their squad cars tracked via GPS. But what happens when the tables are turned and it’s GPS Asset tracking that helps police capture criminals? It turns out their attitude is different. 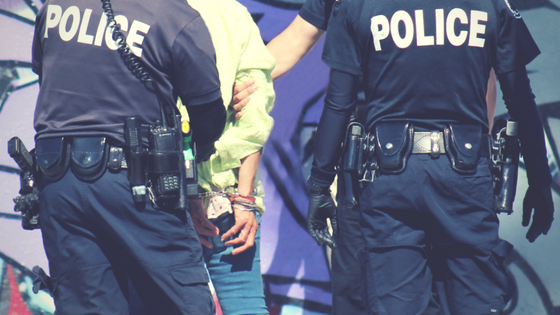 Let’s take a look at a few recent events where the use of GPS tracking helped law enforcement catch thieves and in some cases actually prevent crimes. 1. How Did Police in Burbank, CA Capture Perfume Thieves? First, let’s explore the headline case of the Burbank perfume thieves. In that incident, the two suspects smashed the window of an Ulta cosmetics store and proceeded to grab several bottles of perfume. The break-in activated the store’s burglar alarm and that alerted local police. Luckily for both the business owner and law enforcement, some of the stolen items had GPS tracking devices. Because of those devices, police in squad cars and a helicopter quickly located the burglars on a nearby freeway and then caught them with the stolen goods in their car in Canoga Park, CA. 2. What Happened When a Property Owner in Cincinnati, OH Received a Text from His Air Conditioner? This story has to be our favorite! As reported on USA Today’s Cincinnati.com, when a Cincinnati, OH man, Courtland Gundling of Dearborn Properties, had a problem with the theft of HVAC units from his rental properties, he decided he’d try tracking his air conditioners with GPS. He didn’t really put much stock in whether GPS tracking would help until a couple weeks later, he received a text from one of his air conditioners that read, “I’m on the move.” He and a friend tried chasing after the crooks themselves, but couldn’t catch up, so they called the police, who quickly caught and arrested the perpetrator. 3. Why Bank Robbers in Movies & TV Demand Money from the Bottom or 2nd Drawer. In the old days, the criminals on television and in the movies demanded unmarked bills whenever they robbed a bank. These days you’ve probably seen those fictional crooks demand the money come from the bottom of a drawer or from a second drawer so it can’t be tracked. It’s actually a myth that a bank robber can avoid getting money that isn’t GPS tracked and a bank robber in Chicago found that out the hard way in February 2018. The Chicago Sun-Times reported that he robbed a suburban U.S. Bank branch and received money from the main cash drawer and a 2nd drawer. Some of the money from both drawers had GPS tracking devices on them. These devices allowed the police and FBI to arrest the thief within minutes of the actual robbery. 4. How Porch Pirates Were “Stung” by Police in California. Last year, the Today show ran a story on how police in Cambell, CA use fake packages that look like they’re from Amazon and other retail sites in an effort to catch so-called “porch pirates” in the act. The packages contain a GPS tracking device that allows the police officers to apprehend the thieves within minutes of them stealing a package that contains one of the devices. Since then other police departments throughout the US have used similar methods. Amazon hasn’t started using GPS tracking on your real packages though. Instead, they ask you to trust delivery people with a one-time access code to enter your home to leave the package. Whether you’re tracking your employees, a fleet of company vehicles, or your merchandise, GPS tracking there’s no doubt that GPS tracking can help you protect your business and your assets in many ways, including help you and law enforcement catch the criminals who might steal from you or from your customers. Police and business owners in places like Burbank, Cincinnati, Chicago and other parts of the United States have successfully used GPS tracking devices to help them fight the theft of goods, money, and even HVAC equipment. Have you used GPS tracking to protect your business and your customers? Tell us your GPS Asset Tracking story in the comments below and don’t forget to share this post with friends.